The new local arts magazine from Proctors -- The Collaborative -- is now online. The publication is an outgrowth of the remains of The Alt, and its staff includes former Alt editors David Howard King and Katie Cusack. 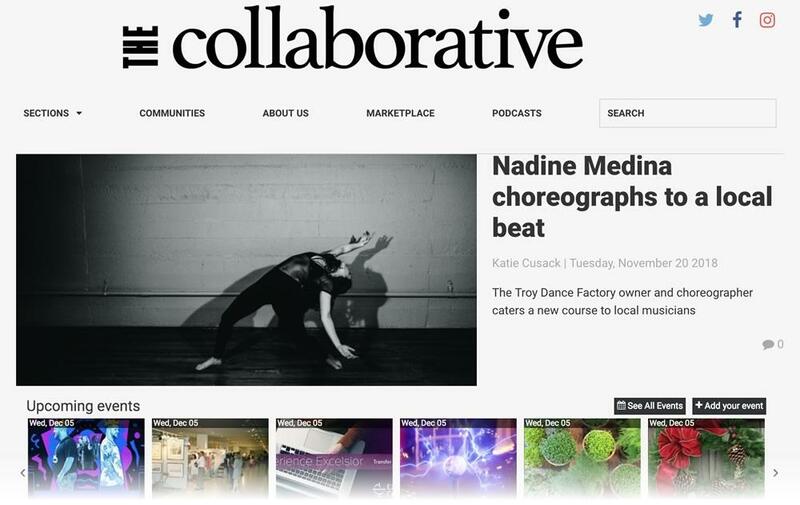 Among the first group of stories: talking with choreographer Nadine Medina (from the Troy Dance Factory) about working with Capital Region music acts, a visit to The Lumberyard in Catskill, a bit about the opening of the Electric City Barn, and a look around local photographer Sarah Pezdek's home. Tonight, though, he's drawing even more attention than usual. With the sun long disappeared behind the autumn night sky, Samson pulls up in his light blue minivan and affixes a projector to a utility box on one side of Henry Johnson, connects that to a MacBook, then carries his buckets of black paint and assorted brushes across the street to a lot littered with condom wrappers and discarded snack-food bags. He takes a long painter's pole and attaches a relatively tiny brush to its end. A man with a sign declaring that he is homeless hobbles back and forth down the opposite side of the boulevard, sometimes answering queries from passersby about why there's a MacBook on the street corner late at night, and why no one's taken it. Here's a list of spots where you'll be able to pick up a physical copy of the mag. Just searched drop locations and was delighted to see chinese fast food spots as well as the expected bars coffee shops libraries.